I was at the workshop of one of my clients & noticed a small engine oil leak on the ground, beneath their Case 855E track loader or drott as they are commonly called here. 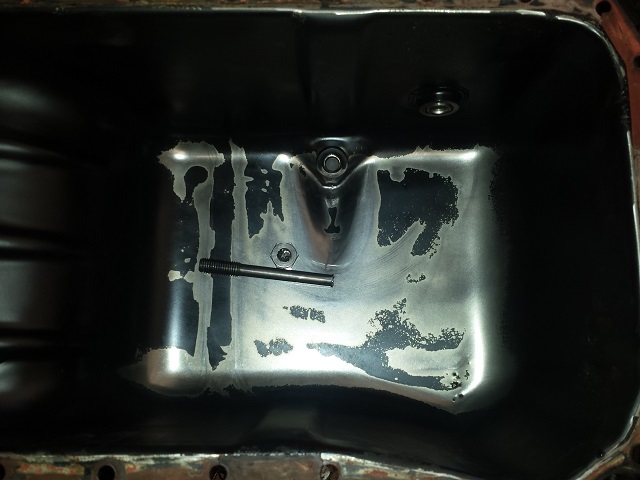 I suggested that we had better take a look ASAP, as that type of leak is usually caused by a hole in the engine oil pan – caused by friction & moisture from dirty machine bellypans. We soon removed the heavy, smelly belly pans to reveal, as expected, a small pinhole caused by a combination of rust & friction. As the last bolt of the engine oil pan was removed & the pan tilted forward, there was a very unnatural rattle that came from the pan …… what the??? This engine was in perfect running order, nothing out of the ordinary was expected. I was fully expecting to see some stones or some other form of foreign matter, but what I found was nothing short of amazing – a main bearing retaining bolt !! The head of one of the bolts on the #2 cap had broken off the bolt & over a period of time the remaining stud had unscrewed & also fallen into the pan. Once fully cleaned the amount of time that these items had been rattling around was revealed. The amount of shine on both the broken bolts & the bottom of the pan makes me think this had been going on for at least a couple of thousand hours!! The #2 cap was removed, fully expecting some type of fretting to have occurred – nothing! – absolutely perfect condition. Two new bolts were ordered & fitted, along with a new pan & gasket & it went back to work. This entry was posted in Crawler Loader/Dozer, Engine Repairs, On Site Service, Workshop Repairs and tagged 850, 850b, 855e, ALR, case equipment, cnh, crawler loader, cummins 6-590, earthmoving, engine, ji case, machinery, oil leaks, preventative maintenance, repair, save money. Bookmark the permalink.